On a drive through Tasmania, writer Gareth Renowden encounters wild animals and truffle-hunting dogs, samples world-class Pinots and sips some lovely local single malt. Tasmania toys with your perceptions. One minute you’re calmly driving past eucalyptus trees, with their ragged mops of leaves, over low, round hills and through little towns with stone houses. The next minute, you’ve turned off the highway into a vineyard and are swerving frantically to avoid wallabies bouncing out from the ranks of vines—a reminder that you’re in one of Australia’s last great wilderness frontiers. Tasmania is an island about 150 miles south of the mainland, across the stormy Bass Strait, a little over an hour’s flight from Melbourne. Home to half a million people, it’s Australia’s smallest state—about the size of West Virginia. No place is much more than a day’s drive away, no matter where on the island you start your journey. I visited Tassie (Aussies like to shorten the names of everything) to learn why it is rapidly becoming known for producing some of Australia’s best Pinot Noirs, Chardonnays, Rieslings and sparkling wines. Tasmanian wines are rarely seen in the U.S.; they’re even difficult to come by in mainland Australia—some of the best producers sell out of every vintage at the cellar door. For now, the best way to try the island’s wines is to visit its four well-marked wine routes. My plan is to start at the Tamar Valley in the north, then drive south through the middle of the island, a spectacular central highland of forests and lakes, and finish my tour in Hobart and its surrounding wine country. En route, I’ll discover that Tasmania’s terroir—its cool, maritime climate and red basalt soil—is also responsible for its superb single-malt whiskey, distinctive truffles and artisanal cheeses, which, like its wines, are produced in small batches and are slowly gaining recognition in the U.S. 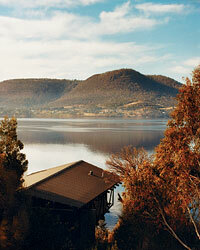 The Tamar Valley has had commercial vineyards since the early 1800s, making it Tasmania’s oldest wine region. Today, its well-marked wine trail has more than 20 cellar doors, many with guest cottages and vineyard cafés. Along the West Tamar Highway, I pass pelicans and egrets near a wetland preserve. As the road strays from the Tamar River, the scenery changes from apple orchards to old mining towns and pastures before I pull into Rosevears Vineyard, where wallabies hop among the vines. I am met at the door by Dr. Andrew Pirie, Rosevears’s winemaker and a founding father of the modern Tasmanian wine industry. After apprenticing at noted French wineries like Hugel et Fils in the early 1970s, Pirie returned to Australia determined to find cool growing conditions equivalent to those in Burgundy and Bordeaux. He discovered a near match in the Tamar Valley and in 1973, founded Pipers Brook Vineyard, today the state’s largest wine producer. He left in 2002 and now produces wines under the Pirie Estate, Tamar Ridge, Rosevears and South labels. 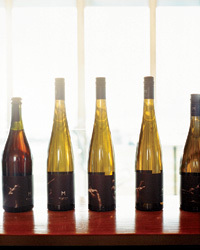 In the tasting room, the soft-spoken Pirie takes me through his various styles of wine: The aromatic whites—like the crisp, floral 2007 Tamar Ridge Riesling—are made in the dry, Alsace style. The standout, though, is the 2005 Pirie Estate Pinot Noir, a gorgeously nuanced limited release with brooding, dark cherry aromas that demonstrates why Tasmania has arguably become Australia’s best region for this famously fickle grape. In the Pipers River area, a 45-minute drive from Rosevears on the eastern side of the Tamar River, the Pinot Noir grape plays a key role in sparkling wines that compare to the best in the New World, not to mention many in Champagne. This area has been making sparkling wines since the Champagne house of Louis Roederer first got involved with Australia’s pioneering Heemskerk Vineyard in the mid-1980s. Today, the original Heemskerk winery building has been converted into the sleek steel-and-glass tasting room of Jansz Tasmania, one of Australia’s best-regarded sparkling-wine producers. Winemaker Natalie Fryar is on hand to tell me about Jansz’s toasty, nonvintage méthode Tasmanoise and wonderfully complex vintage sparkling wine. Both have distinct lemon and honeysuckle aromas, but the Premium 2002 Vintage Brut has a nutty creaminess that Fryar says results from aging the bottles four years on the lees. I skip the informational videos in the new visitors’ center to linger over the view of the water with a glass of 2003 cuvée and an accompanying platter of local cheeses, including an extraordinarily creamy cheddar from Ashgrove, a family-run dairy in Elizabeth Town. The Tamar wine loop starts and ends in Launceston, Tassie’s second-largest city, which is fast catching up to Hobart’s locally minded food scene. That evening, I have dinner at the long-established but still stellar restaurant Fee & Me. My meal is a celebration of the first truffle harvest of the season: creamy, frothy truffled cauliflower soup with little truffle toasts, perfect with two Tasmanian east coast Pinots, the 2004 Kelvedon Estate and the 2004 Freycinet. The truffles were sourced from my friend Tim Terry, the man who claims to have grown Australia’s first Périgord black truffle back in 1999. Terry’s farm, Truffles Australis, is just a half-hour west of Launceston in the farming town of Deloraine. I decide to make a detour very early the next day. Coming over the hill along a dirt road, I spot teams of dogs and their handlers out sniffing for the day’s harvest as the rows of hazelnut and oak trees emerge from the mist. The powerful aroma of ripe truffle precedes Terry as he opens the front door—he’s preparing a shipment of the fungi for some of mainland Australia’s top restaurants, like Vue du Monde in Melbourne, as well as restaurants in New York. He recently started leading truffle hunts for visitors and selling truffle-enhanced salts and oils from his farmhouse. Terry cooks me a breakfast of truffled scrambled eggs before I continue south across Tasmania’s vast central highlands. This flat stretch of red soil is studded with trout-filled lakes; for miles I see nothing more than World Heritage forests and the occasional lone fisherman along a river’s edge. The silence is absolute, and the air is cold and crisp, with hints of eucalyptus on the breeze. It’s eerie and beautiful, uncompromisingly Australian, but on a more human scale than the outback. It was here, deep in the wilderness, that the Tasmanian whiskey revival was first conceived. More than 20 years ago, Bill Lark, a surveyor and single-malt enthusiast from Hobart, was struck by the thought that his island had all the makings of good whiskey on hand: clean, soft water; Australia’s best barley; peat to smoke the malted barley in the manner of the great Islay malts from Scotland. The first Lark malt was produced in 1992 in small quantities. Since then, other distilleries have opened, including the new Nant Estate, just miles from Lark’s peat bog in Bothwell, a remote town in the central highlands. Like Tasmania’s wines, its single malts are quietly attracting worldwide attention. I find out why the next day, at Lark Distillery’s waterfront cellar door and whiskey bar in Hobart. Lark’s avuncular tour manager, Mark Nicholson, sits me down in a red leather chair next to an armful of bottles and a ploughman’s lunch of local King Island Dairy cheddar, wild Tasmanian salmon and peat-smoked trout that’s been marinated in Lark whiskey. The malt itself is a lovely thing, honey-colored with a beguiling peppery character, but the star is a dram of what Nicholson reckons is the finest whiskey Lark has ever made. Each bottling comes from an individual oak cask originally used for aging port or sherry. Over three to five years, as the raw alcohol interacts with the wood, it develops complexity and finesse. But when the company tapped the 131st barrel since production began 16 years ago, it turned out to be spectacular. A deep golden liquid with marmalade and spice notes, it was bottled as a cask-strength special edition. By the time I tasted it, there were only 12 bottles left. I had to buy one. The Derwent and Coal River valleys, home to top producers like Domaine A and Moorilla Estate, are 15 minutes outside of Hobart. Set in the shadow of Mount Wellington’s majestic snowcaps, the wineries reflect Hobart’s hip, artsy vibe. Founded in 1958, Moorilla Estate is another Tassie wine pioneer recognized for its Pinot Noirs, Rieslings and Chardonnays. It is also one of Tasmania’s most forward-thinking and entrepreneurial wineries, having added an on-site microbrewery—Moo Brew—and guest chalets that look like space-age tree houses perched above the Derwent Estuary. Elvis Costello and the Violent Femmes have played concerts amid the estate’s vines; next year, Moorilla will open the Museum of Old and New Art, Australia’s largest privately funded art museum. I could easily spend an entire day just at Moorilla, but instead I retire early to Hobart’s Islington Hotel: It’s been described as the last bastion of luxury before the South Pole, and though I’ve never been to the South Pole, I can’t find it in my heart to disagree. Dinner is served at an antique Austrian farmhouse table in the country-style kitchen: supremely tender, grass-fed steak from King Island Beef paired with an easy- drinking 2005 Pinot Noir from nearby Stoney Vineyard. Tasmania may be one of Australia’s last great wilderness frontiers, but after three days of tasting remarkable wines, whiskeys, truffles and cheeses, I would have to argue that it is also the country’s most exciting new food-and-wine zone. Gareth Renowden, author of The Truffle Book, lives on a farm in New Zealand. His blog, On the Farm, is at limestonehills.co.nz.